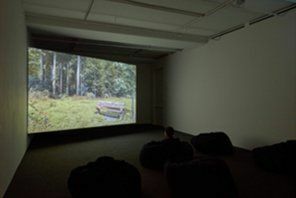 Epson America has partnered with the Sean Kelly Gallery to provide Pro G series large venue projectors for the exhibition LIGHT/WORK by Belgium-based artist David Claerbout, on view now through April 30 in New York City. LIGHT/WORK presents an overview of the artist’s recent film work, from his seminal work Travel to his newest piece Olympia, which will be on view for the first time as part of the installation. The films are projected using four Epson Pro G projectors to create a compelling presentation. For this exhibition, Epson provided the gallery three Pro G6970WU projectors and one Pro G6770WU projector, with both models providing Full HD support and HDBaseT connectivity for simple yet robust integration. The projectors offer image quality and high color brightness – both models boast 6,000 lumens of color brightness and 6,000 lumens of white light brightness – as well as additional features including built-in edge blending, 360-degree projection and diverse selection of inputs for projecting from multiple sources.